Marko is one of the fastest, lightest and most powerful HTML templating engines for Node.js and the browser, and we are very pleased to see a healthy and growing community. Marko has been downloaded over 100k times in the first few months of 2016, and the project has a very active Gitter chat room. We are excited to announce some huge improvements to the Marko templating engine as part of the v3 release. First off, a huge thanks to all of the contributors who have provided code and feedback for the amazing Marko v3 release (see #90, #211, especially Adam McArthur, Achim Vedam, Bryce Watson, Dan Cech, Dan Richman, Kristian Mandrup, @onemrkarthik, Phillip Gates-Idem, Sathish Pottavathini, Sandeep Raveesh, Scott Davis, Sean Gates, Sunny Gurnani, @tindli and Yoni Medoff)! Extra thanks to Phillip Gates-Idem for taking on the arduous task of building the new htmljs-parser used by Marko v3. For Marko v2 users, you can use the marko-migrate tool to automatically migrate your Marko v2 templates to use the new Marko v3 syntax. For a complete list of what changed in Marko v3, please read What's New in Marko v3. Marko has been shown to be one of the fastest templating engines with almost 2x the speed of Handlebars and 5x the speed of Jade and nunjucks. 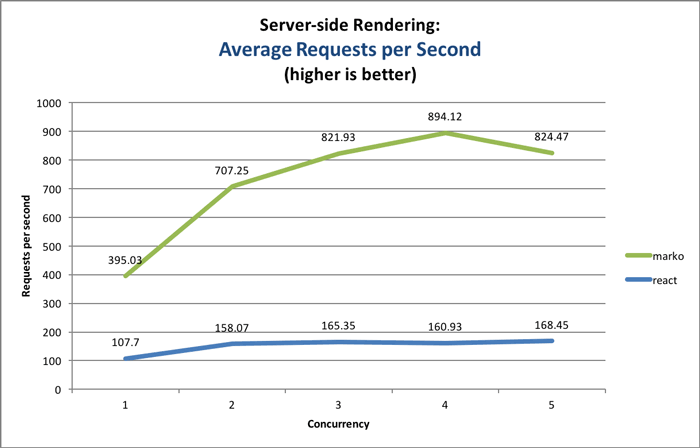 In addition, in a real-world benchmark, Marko (paired with Marko Widgets) was shown to be 10x faster than React when rendering a search results page on the server using a very similar UI components architecture. An order of magnitude difference is very significant and this performance gap translated to the React app only being able to handle ~72 requests per second, while the Marko app achieved ~820 requests per second. Marko offers streaming and asynchronous rendering, and these features make it easy to create pages that load near instantaneously when rendered on the server (see KnowThen: Episode 8 – Serving Content in Koajs with Marko). The Marko compiler produces minimal and readable CommonJS modules as output and the runtime is only about 3.5KB gzipped. While performance of Marko is best-in-class, usability is also very important. Marko v3 introduces a new HTML-JS syntax and a new parser that makes Marko more intuitive. Marko has always been designed to have strong support for building UI components that encapsulate rendering logic, client-side behavior and styling. Marko Widgets is a UI component building library that uses Marko templates as the view. Marko Widgets offers advanced features like DOM diffing/patching, batched updates, stateful & stateless widgets, declarative event binding, and efficient event delegation. Marko, combined with Marko Widgets, is a very compelling solution for building high performance web applications with a universal/isomorphic UI components-based architecture. Marko Widgets adopted many of the great ideas promoted by the React team. Marko's clean HTML-based syntax has been a strength, but over time it became clear that utilizing a strict HTML parser was actually putting unnecessary constraints on the Marko language that negatively impacted code readability and usability. The new HTML-JS syntax that ships with Marko v3 breaks away from the limitations associated with the standard HTML syntax while still maintaining the look and feel of HTML. The previous release of Marko utilized an off-the-shelf HTML parser that parsed all HTML attribute values as strings. Separate tag schema files were required to associate type information with an attribute value for custom tags. To make this more clear, let's take a look at a simple template. The information provided in the schema instructed Marko on how to interpret string attribute values. The schema approach worked, and it was simple, but the necessity for a schema was an annoyance and it degraded template readability. The move from HTML to HTML-JS is analogous to moving from XML to JSON to store human readable data. With XML, all attribute values are parsed as strings and a separate schema file is needed to associate type information with attributes. JSON, on the other hand, supports types (namely, strings, numbers, booleans, objects and arrays). JSON is far superior to XML in most cases because it has a clean syntax that supports types. The concise syntax removes a lot of the noise associated with the traditional HTML syntax and makes it much easier to modify a template without having to worry about matching opening and closing tags. In addition, the marko-prettyprint tool can be used to convert between the two syntaxes at any point. The new concise syntax for Marko was heavily inspired by Jade/Pug. However, we reduced the number of grammar rules with Marko to make the concise syntax easier to grasp and closer to HTML. Marko Widgets is a UI component building library that uses Marko templates as the view. Marko Widgets has a lot in common with React, but Marko Widgets uses Marko templates to define the view and React typically uses JSX to define the view. In contrast, Marko was designed to allow template authors to describe the intent while giving the compiler and runtime much greater flexibility in determining the how. Marko allows compile-time transformations and custom code generators for custom tags and custom attributes for further optimizing compiled templates. Among other things, the Marko compiler concatenates all static blocks of HTML into a single string and it removes extra whitespace. While not fully exploited, the architecture of Marko allows different compiled code based on custom output modes. For example, the Marko compiler can either produce a program that, when executed, streams HTML (for use on the server) or creates a DOM tree (for use in the browser). A very large portion of Marko Widgets is implemented as compile-time code transformations and code generators. As a result, the runtime for Marko Widgets is fairly minimal. Marko has chosen to focus on rendering HTML while React has chosen to focus on rendering virtual DOM nodes. Once JSX is used to render a tree of nodes on the server, it is then necessary to walk the entire tree to serialize it to HTML for sending to the browser. Building and traversing a tree requires more memory and CPU than just running a program that renders HTML in a single pass (especially as the complexity of the DOM increases). The Marko compiler produces a program that renders a template to a stream in a single pass. On the server, writing HTML strings to an output stream is extremely efficient. A smart compiler paired with a runtime that supports streaming and asynchronous rendering allows Marko to excel on the server. In the browser, our benchmark showed no significant difference in performance when comparing Marko Widgets and React (although Marko Widgets seemed to have an edge in the mobile iOS browser). Despite differences in the design of Marko Widgets and React, both support building UI components with rich features such as transclusion, container components, parent/child relationships, efficient event delegation and views based on state. On the client, web browsers can very quickly translate an HTML string into a DOM tree and it turns out that a virtual DOM is not needed to achieve the benefits of DOM diffing/patching. The morphdom module was created to enable DOM diffing/patching using only the real DOM. Marko Widgets has adopted morphdom and offers a very simple approach to building UI components with views that automatically and efficiently update when state changes. Marko Widgets is compatible with application state containers such as Redux. We have found it very rewarding to see the Marko community growing, and eBay has continued to be a major contributor to this open source project. It is exciting to see more teams outside eBay adopting Marko, and, as this project has matured, we are seeing more and more outside contributions (including documentation, tools, code improvements and ideas). We also released a marko-migrate tool that will automatically migrate your Marko v2 templates to use the new Marko v3 syntax. Marko is heavily tested with over 600 individual tests for Marko and its new parser. eBay is far along in transitioning to the Node.js stack for the website front-end and Marko and Marko Widgets has been the technology of choice for almost all teams. As a result, Marko and Marko Widgets have been battle tested in production. If you have ideas on how to improve Marko please let us know. We welcome new contributors so if you would like to help out please join us in the Gitter chat room for Marko, file an issue on Github or send us a pull request.